I think just about everyone in Michigan is excited about this warmer weather. Even though it’s not quite as balmy as we’d like, I think winter has received the message that it’s time to leave the building for awhile. Or at least I’m trying to think positive. Anyways, lets get back on topic. If you checked out my black bean brownie post, you can probably guess that I tried a different rendition this time. I felt adventurous again, so I made brownies with Greek yogurt instead of butter and eggs. Not a bad way to keep these bad boys slightly less guilty than the norm, right? Plus, yogurt creates an airy, fudgy texture, which I prefer. No judgment if you like ’em cakey (that’s just not my style). So, if you’re feeling as celebratory as I am about spring, or if you’re just looking to create a killer Easter menu, my springtime brownies are sure to be the best dessert at the party. With mint green frosting and excessive amounts of sprinkles on top of dense, chocolaty goodness, you can’t help but smile as you take a bite. Share your thoughts with a comment, or send me a Tweet, share a post on Facebook, or tag a photo on Instagram @coneysandkale! Sprinkles to add on top of the frosting layer! 2. Grease an 8x8x2 baking dish or line with parchment paper. 3. In a large bowl, combine flour and baking powder, and set aside. 4. In another bowl, melt 1/2 cup chocolate chips in microwave in 20 second increments, stirring as you go until smooth. Then, stir in the sugar, vanilla, cocoa powder, and yogurt. 5. Fold in the wet ingredients with the dry ingredients. Add in the rest of the chocolate chips (and feel free to add more if you desire)! 6. Pour batter into the ban and bake for about 35 minutes or until toothpick comes out clean. 7. While the brownies are baking, use a hand or standing mixer to beat the butter on medium speed for about 2 minutes until creamy. Add the confectioners’ sugar and milk, and then beat for an additional 2 minutes on medium. Add mint and food coloring, and beat on low for another minute until everything is combined. 8. When the brownies are done, remove from oven and let cool. 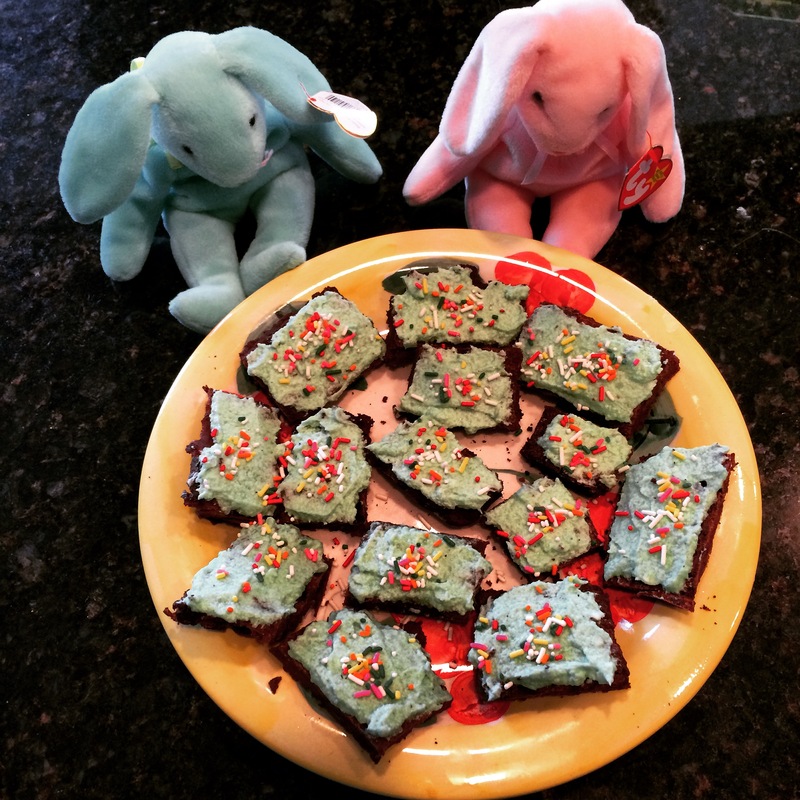 Frost the brownies, add lots of sprinkles, and chill in the fridge for at least 1 hour before serving.